A victim of a stroke who claims that she did not receive adequate medical attention, and who now suffers from permanent brain damage, has been permitted to continue pursuing a claim for damages against Kingston Hospital and the doctors charged with providing her care. The case in question is Randall v. Kingston Hospital, recently considered by the Third Department of the New York Appellate Division. The plaintiff in the case, Martha Randall, had been suffering from a protracted case of pneumonia and had been admitted to Kingston Hospital on February 7, 2009 for treatment. On February 21, she told her nurses about a “pounding headache” she was experiencing. The nurses reported this to her doctor, Todd Baldwin, who ordered Randall’s nurses to give her Tylenol for the pain. Three hours later, Randall’s husband reported that Randall was showing signs that she was experiencing some sort of neurological disturbance. Baldwin ordered a CT scan, which showed that Randall had a hemorrhage in her brain, or hemorrhagic stroke. About a half hour later, the charge nurse learned of these test results, and a neurologist took over Randall’s care. The hemorrhage grew, and the next morning, Randall had brain surgery to correct the issue. However, the stroke caused Randall to suffer permanent substantial vision loss, the inability to walk unassisted, and certain problems thinking. Randall and her husband filed a lawsuit against Kingston Hospital, Baldwin, and the physicians’ group that employed Baldwin. The defendants all moved for early dismissal of Randall’s claim, arguing that she did not have a valid claim for compensation against the medical professionals. The defendants won, and Randall appealed the decision. The Appellate Division noted that whether or not Randall had a claim against the defendants depended on whether she would’ve had a better outcome had the doctors provided better care, in line with current standards. In a lawsuit for medical malpractice in New York, the court stated that a defendant seeking summary judgment is required to prove that “either there was no departure from accepted standards of practice in the plaintiff’s treatment or that any such deviation did not injure the plaintiff.” (internal quotations omitted). 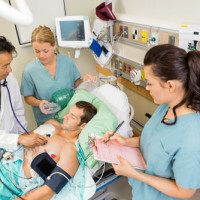 In essence, this means that if the doctor did what a reasonable doctor would have done in a similar situation, or acted differently but in ways that didn’t result in the plaintiff’s injuries, then the defendant doctors aren’t liable for the plaintiff’s injuries. For example, if a patient came to the hospital with a broken arm and ended up with permanent damage to that arm, the hospital might be liable to the patient if they took too long to set the patient’s arm after determining that it was broken, but might not be liable if they used an untraditional but medically-acceptable method for wrapping the broken arm. Here, the court found that there was enough of a factual question as to whether or not Randall’s outcome could have been better with faster care and better attention to her specific condition that the claim for malpractice was permitted to move forward toward trial. If you or a loved one have been injured by a negligent doctor or medical facility in New York, contact the compassionate and knowledgeable New York medical malpractice attorney Leandros Vrionedes at 212-889-9362.